It wasn’t easy to eat a sundae and take photos of the store at the same time, so unfortunately I had just a few bites and then got to work. My favorite thing about a Ghirardelli sundae? Definitely the hot fudge. It’s thick and creamy the way fudge should be, and here you can get in in milk or dark chocolate! Ok, back to the shop… Here’s where you order when you first walk in. After ordering, head to the assigned pick up window — then grab your napkins and utensils on the way out! Don’t feel like having a specialty sundae? 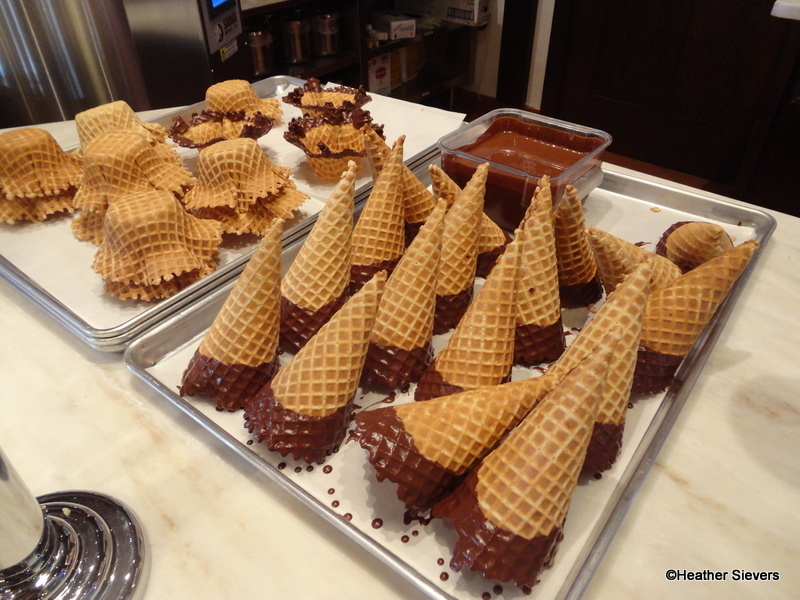 Feel free to order individual scoops that can be served in sugar cones or cups — OR homemade waffle cones or bowls, with an optional chocolate dip! 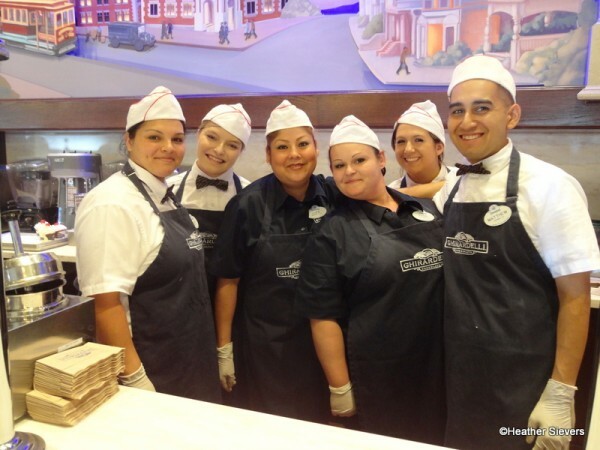 The happy-to-serve-you cast members had just finished a batch that smelled absolutely delicious. 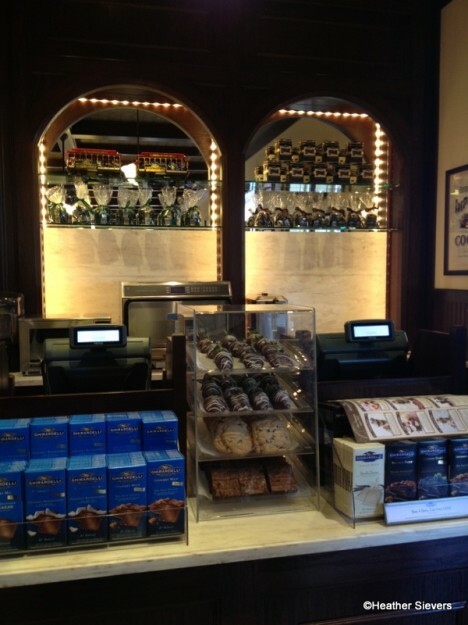 In addition to sundaes & scoops, Ghirardelli offers their own chocolate drinks as well as shakes, floats, malts soda, tea, coffee, and espresso drinks. 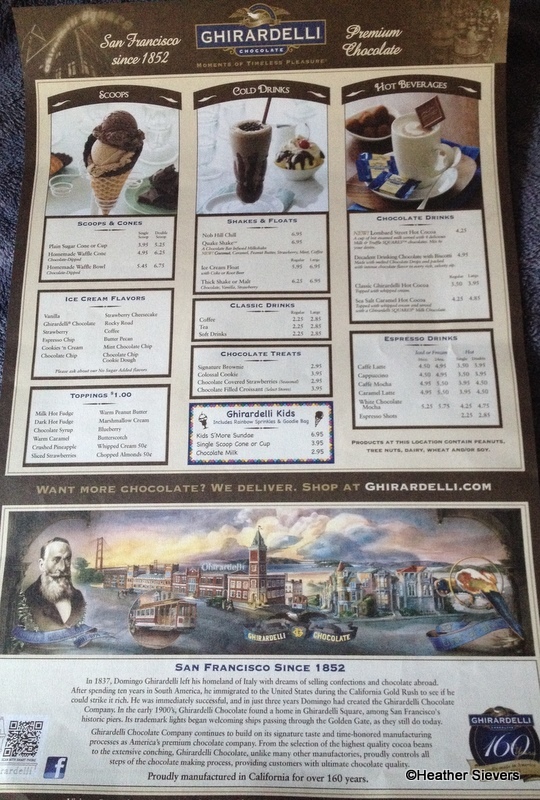 There’s even a Ghirardelli kids menu that features a S’more Sundae, smaller ice cream scoops & chocolate milk! 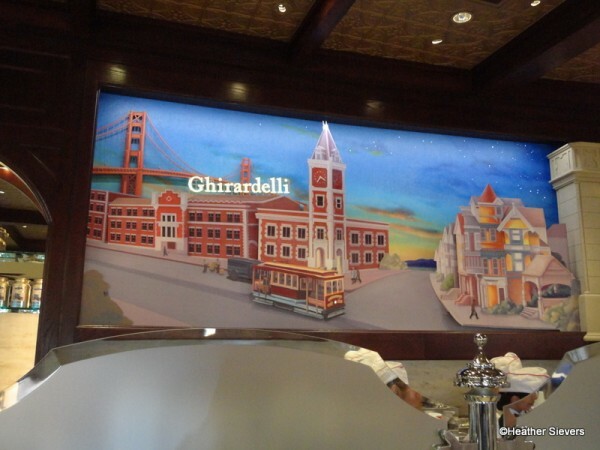 What the Anaheim location does have that is unique and unlike any other Ghirardelli store is the amazing interactive mural that is located behind the pick up window. Featuring some very famous San Francisco landmarks, the mural comes to life when certain sundaes are ordered off of the menu! So for example, if you order The Earthquake (8 scoops ice cream, 8 delicious toppings, finished with fresh bananas, chopped almonds, chocolate chips & cherries) the building below will start to shake and rumble. If you order The Cable Car (rocky road, chocolate chip & chocolate ice cream with marshmallow, hot fudge, and whipped cream topped with chopped almonds, a cherry & Ghirardelli chocolate squares), the cable car will move up and down the street. Feel like ordering a sundae named after the founder of Ghirardelli? If you order The Domingo, a small portrait of Domingo Ghirardelli lights up just below the clock in the clock tower. 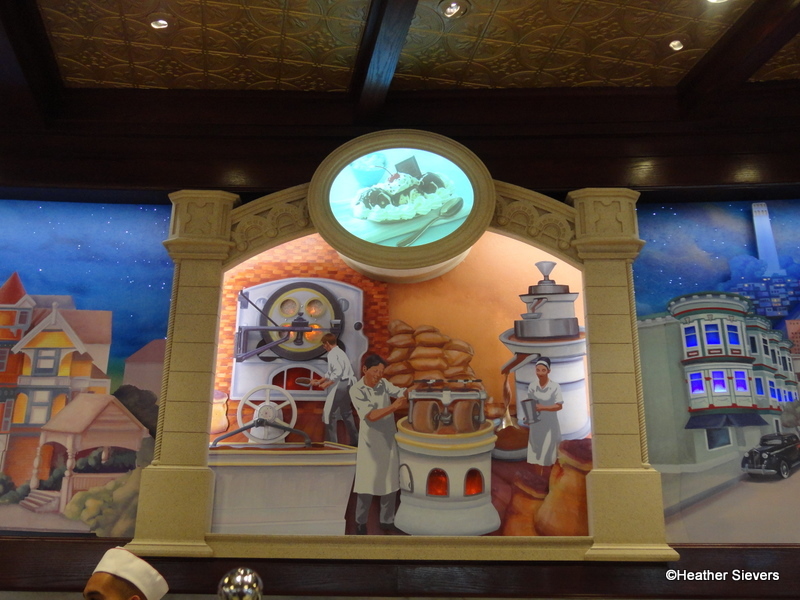 The center of the mural features a scene of chocolatiers making what else? Chocolate! This scene moves continuously. The fires burn, the wheels spin and the chocolate flows! 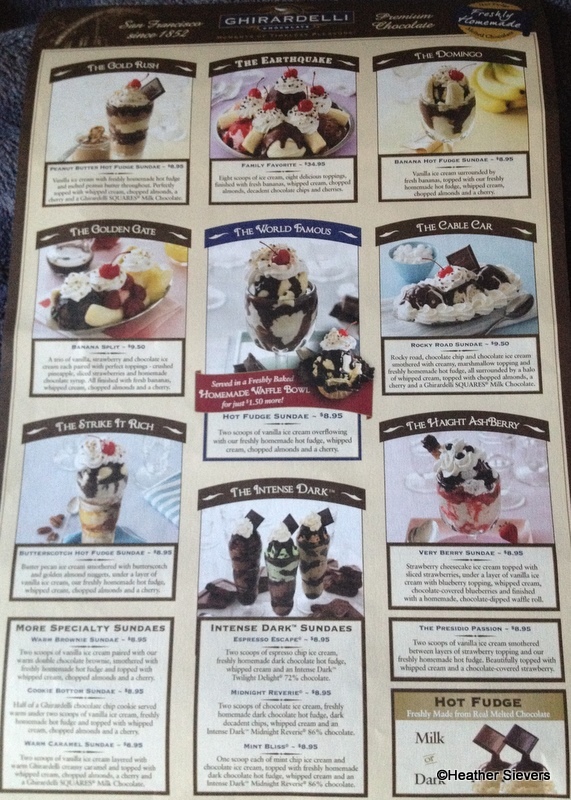 The oval screen on top shows a picture of each sundae as it is ordered. The one shown below is The Cable Car! 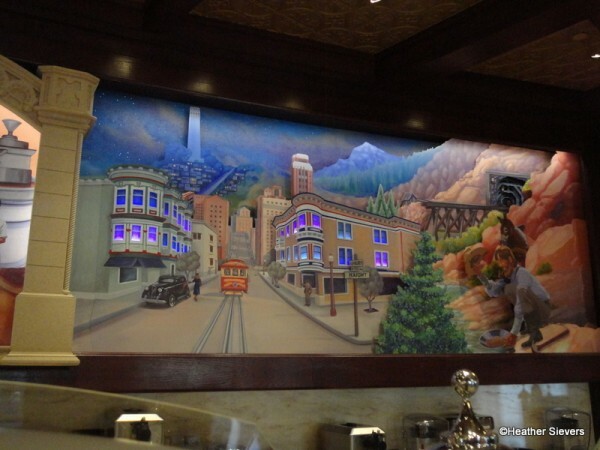 The far right of the mural depicts Haight Ashbury and a Gold Miner. If you order The “Haight AshBerry,” the lights on the street and in the windows glow and the trolley moves down the street. If you order The Gold Rush or Strike it Rich, the gold miner starts to “pan” his gold, the gold sparkles, and fun music plays! 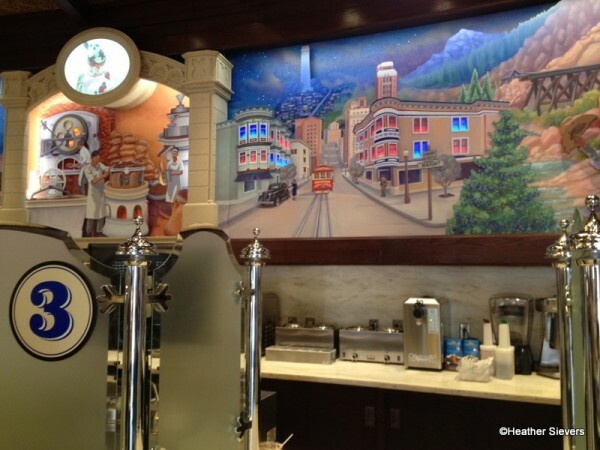 I even took a little video of the mural to share with you…first we pan through the mural, and then you can watch the effect from the Earthquake sundae! I think it’s such a clever way to make the shop unique! Not interested in ice cream or sundaes? The shop has tons of chocolate goodies to choose from. 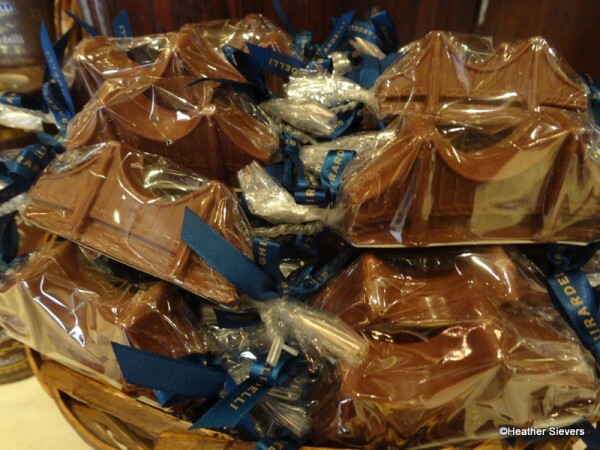 The Golden Gate Bridge in Chocolate! 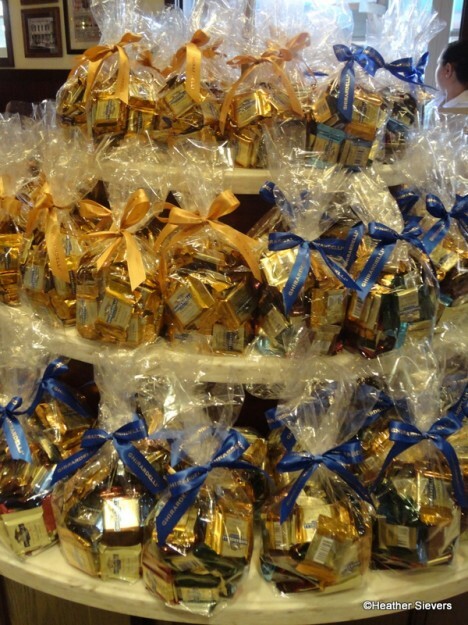 Everything from Ghirardelli Chocolate Squares in bulk to mini chocolate Golden Gate Bridges can be found here. If you aren’t ordering something from the menu, you may bypass the line and head straight for your chocolate shopping spree. 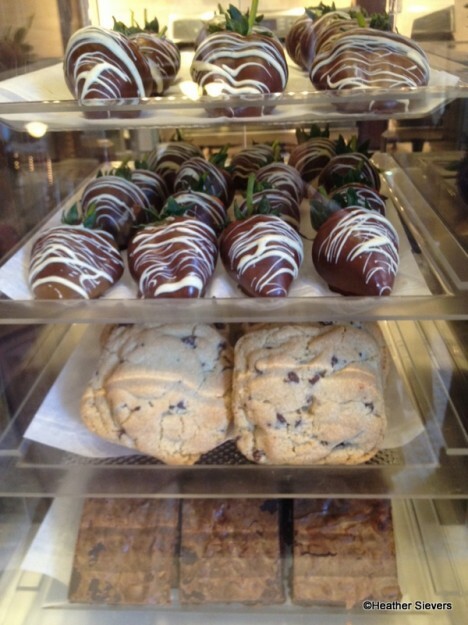 Gather your goodies and head to the register towards the back of the shop to make your payment. After all purchases are paid for and picked up, you exit the store to pick up napkins and utensils. 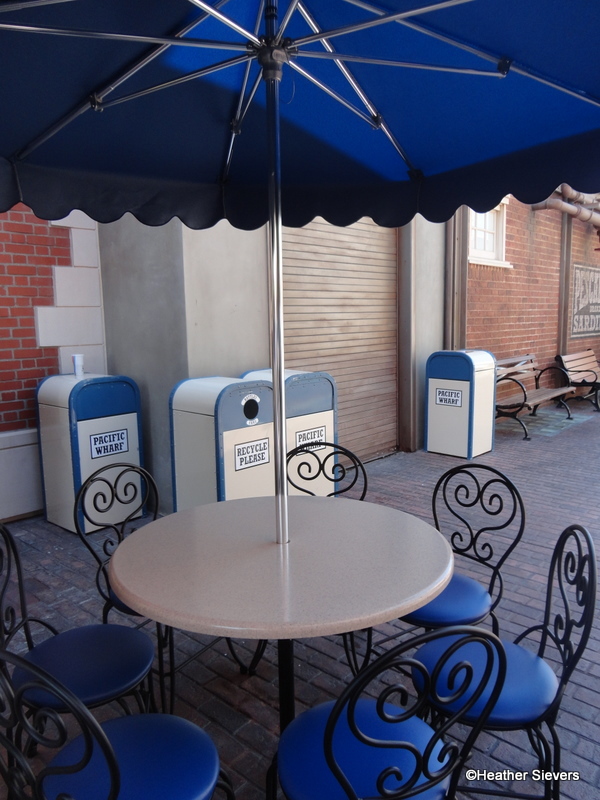 There is no indoor seating here, but there are several umbrella covered tables outside as well as lots of seating in the nearby Pacific Wharf seating area. 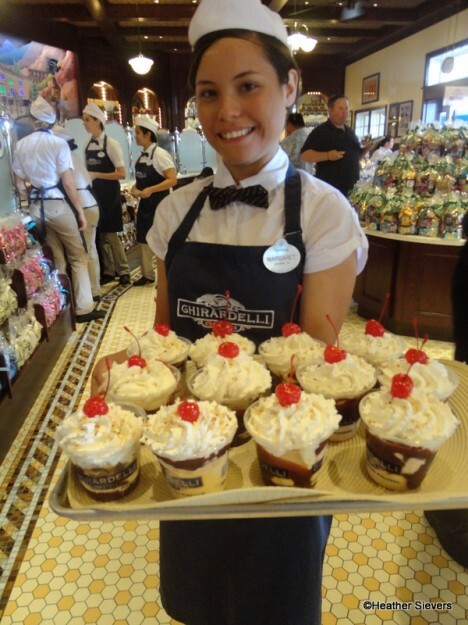 Founded 160 years ago in San Francisco, Ghirardelli is one of the only chocolate companies that oversees production of their product from “bean to bar.” This means that they do not purchase any pre-made, unsweetened chocolate bases as many companies do, but rather start with the cocoa fruit and build a superior product from scratch. 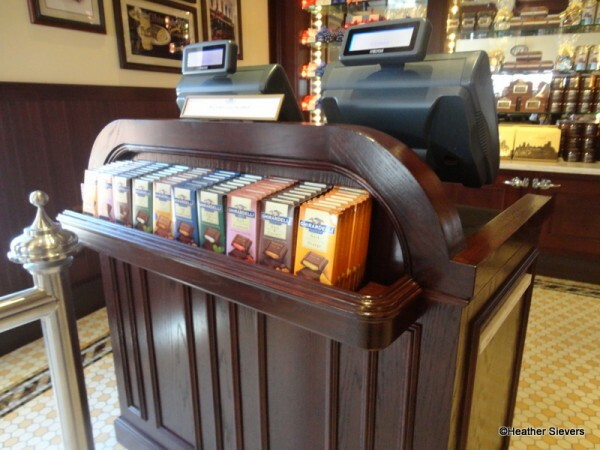 Ghirardelli really prides themselves on that “bean to bar” process. They even had a “Chocolate Professor” at the opening to share the chocolate making process with us, which was really quite interesting. 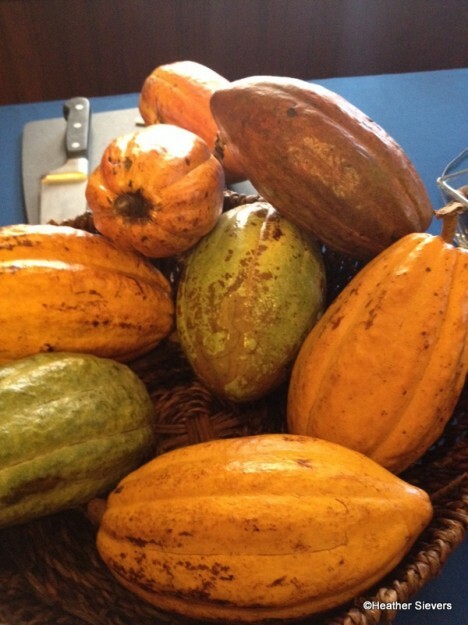 I had never seen a cacao pod before! After the seeds are removed from the fruit, they are then roasted, cracked into “nibs,” and then “winnowed” (husk removal). 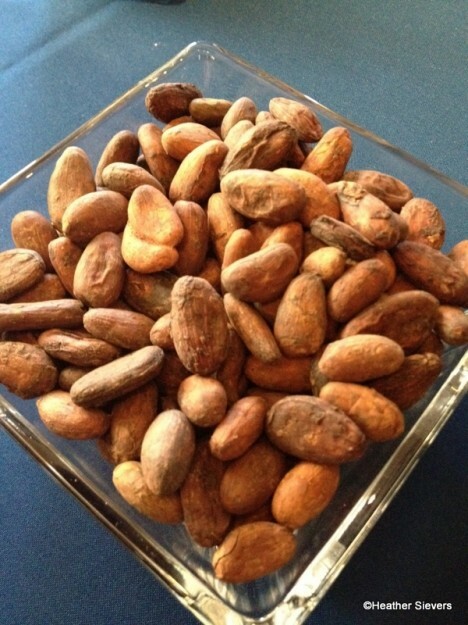 Cocoa Seeds Cracked into "Nibs"
Once the nibs are ready, they are ground into a paste, which is where the unsweetened chocolate base comes from. At this point, the chocolate is very very bitter (bottom left bowl). Conching the chocolate is next. 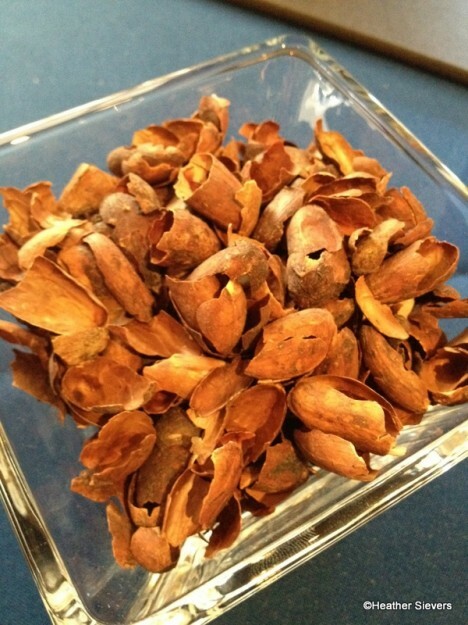 This is the “ingredient” adding process. For milk chocolate you add milk powder (middle left bowl), sugar (top left bowl) and oil (top right bowl). 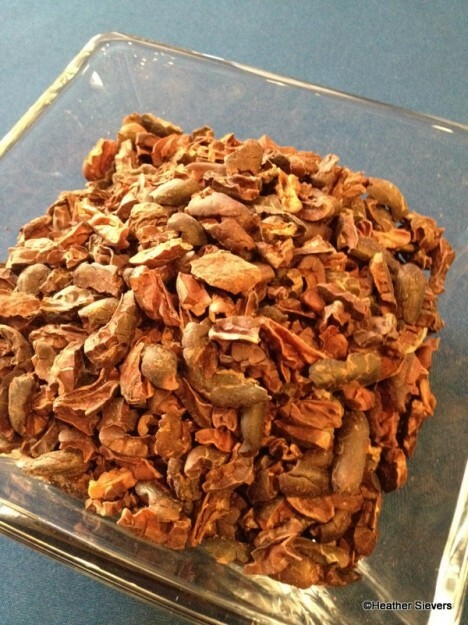 For dark chocolate, you leave the unsweetened base and add oil and sugar. I really thought that it was interesting to see Ghirardelli’s chocolate making process. After asking if these types of demos would be offered in the store on a regular basis, we were told that it was quite possible and they hoped to offer them for guests. 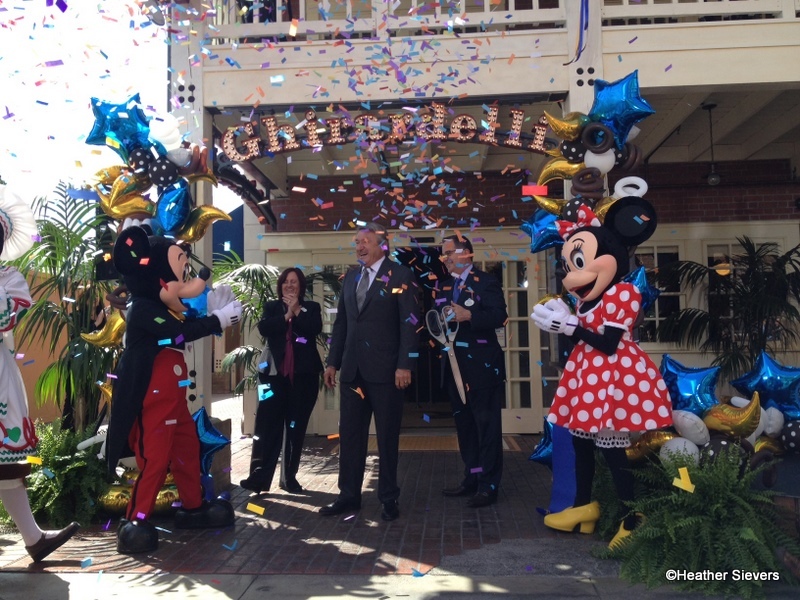 I really feel like Ghirardelli is a great match for Disney California Adventure. It’s 160-year-long residence in the state makes it a noteworthy part of California’s history. Besides, who wouldn’t want a great place to get a unique sundae!?! I can’t go wait to go back to try out The Gold Rush peanut butter hot fudge sundae. Are you a Ghirardelli fan? 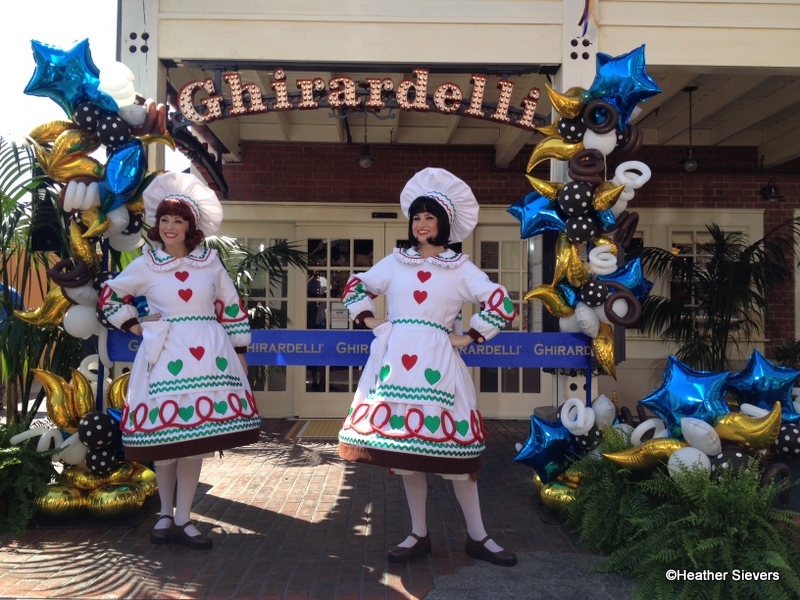 Have you been to Ghirardelli’s newest location at Disney California Adventure? Got a favorite sundae? Tell us about it! « Vinylmations are SO TASTY! Love Ghiradelli’s and love that one finally opened in California Adventure! My favorite Disney park! This looks like a great addition to DCA! 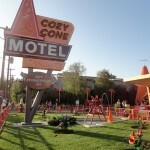 I can’t wait to see it when I’m there for the Cars Land opening on the 15th! One quick question-is there anything there that is vegan? Thanks! Another good one Heather! Thank you. I love that mural! 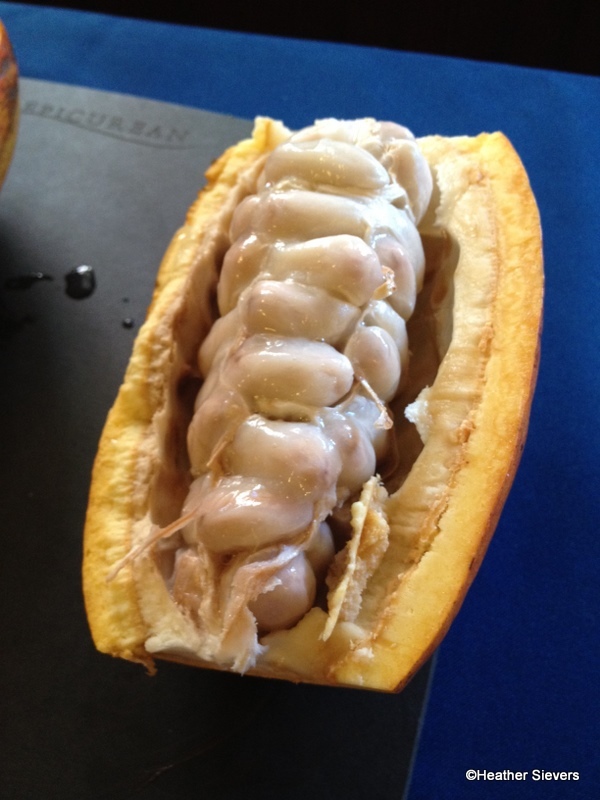 How cool and if I was ever out there I would love to learn more about the process of turning the beans into chocolate! I really need to take more time on my next WDW trip and visit Ghiardelli’s for a specialty sundae.. I can’t believe in all my years of going to Disney I’ve never done that. Thanks for this great post! 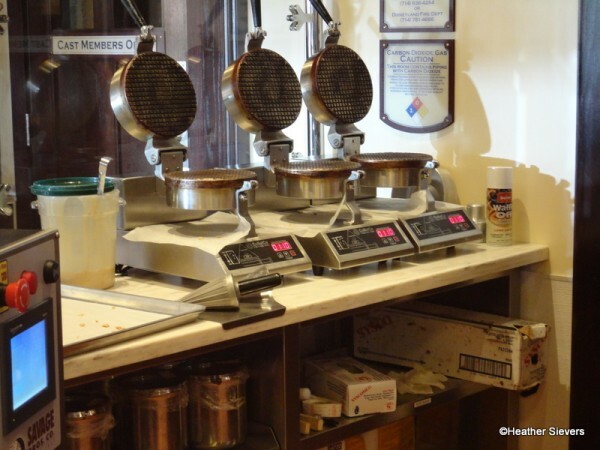 Perhaps I’m jaded by having been able to take the free tour of the Hershey’s facility in Hershey Pennsylvania, but the Ghirardelli’s chocolate making process uses milk POWDER and oil to make their milk chocolate? Hershey’s uses whole milk from local cows. I can’t say that I find much of a difference in the taste, but the use of whole milk to me is a lot more appealing that milk powder and oil! 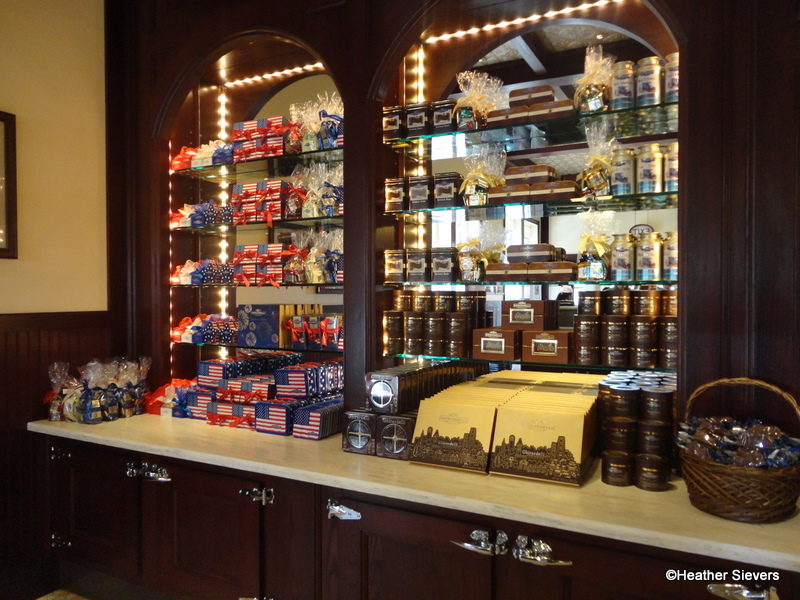 I’ve been to the Ghirardelli’s store in downtown disney. The place is permeated with the smell of chocolate enough that this chocoholic just wants to stand there and smell the air all night. Trying to find a place to sit down inside on a hot night is impossible. The best bet is to get your ice cream to go. Grab a handful of napkins and take a quick walk across the plaza and plant yourself on the wall by the lake or walk down the promenade towards lego land to enjoy your ice cream without the hustle and bustle of the actual store. Was it just me or was that video not in focus? Made me a little dizzy trying to figure it out. Also, is there anything dairy free for lactose intolerants like me? Wow. It all looks soooo good. I plan on visiting the shop at Downtown Disney next year…I’ve never been to it. Thanks for the story Heather! I’ve had the pleasure of stopping by and I’ve already enjoyed my first sundae. My only complaint is that the location doesn’t provide edutainment on the making of chocolate and the history of chocolate making in California. Without an area devoted to providing information, this location feels like an upgraded retail shop that I would expect in a location outside of a theme park with paid admission. I’m thrilled to get the new dining location, but it feels like an opportunity was lost for DCA to provide both sides of the Ghirardelli brand to the DCA guests. That being said, I’ll be standing in line this weekend to sample more treats and to check out the interactive mural! Here’s a vote for the very berry Sundae. It’s as good as it gets! 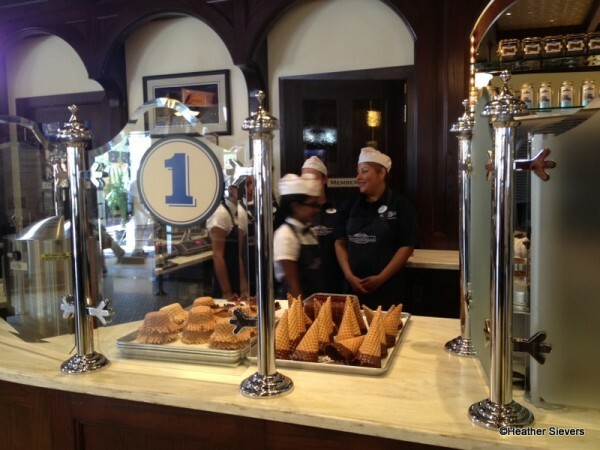 they have amazing sundaes .. its a must evertime we are at disney…. @Katie – Me too. 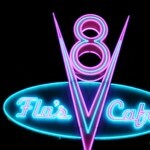 I LOVE their hot fudge the most! @Steph – That is a good question, I’m not sure. I bet any cast member could tell you. I will also try to find out. 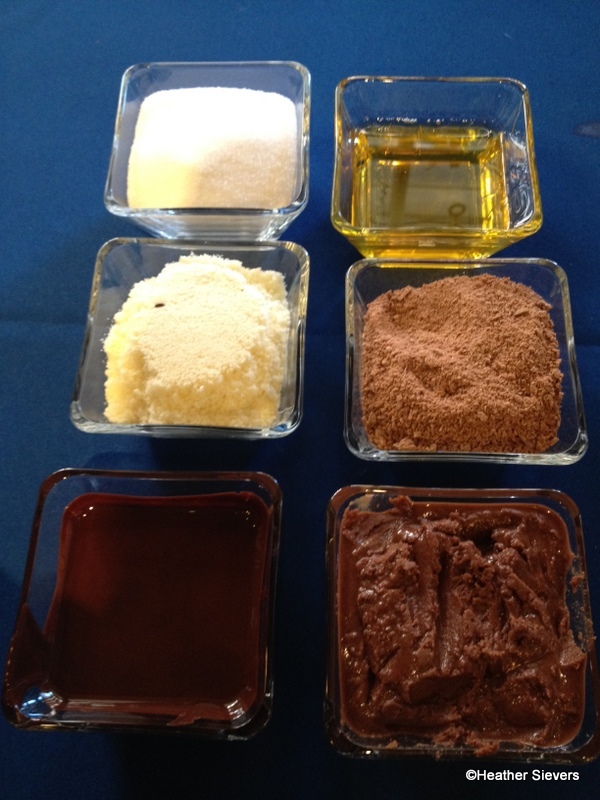 @Craig – We were told that the one in Anaheim might offer chocolate making demos. I hope they do, it’s very interesting! @Lisa – We’re working on our video quality, sorry! Also not sure about the dairy free, will try to find out. @Colin – I really hope they start doing the chocolate making demos. We were told it was a possibility. @Alan – I’ll have to give that one a try! 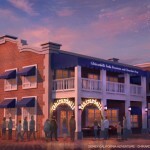 @Canadianslovewdw – I have a feeling they’re going to become a must here in Anaheim too! My fav sundae here is the Presidio Passion, SO good. 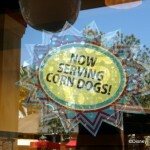 I was craving it when I was at WDW last month, but never made it to DTD. 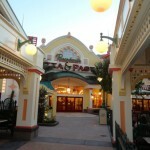 I travel many times to WDW and have dinner at a restaurant in Disney’s Market Place. 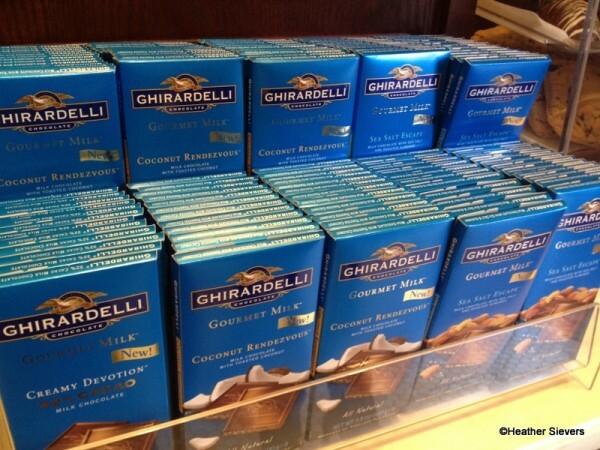 Instead of dessert in the restaurant, we walk over to Ghiradelli’s and order a dessert there. If you ask, they will create a sundae just the way you like it too…..mmmmmm! Vanilla ice cream, smothered in hot fudge, sprinkled with chopped nuts and of course, whipped cream. 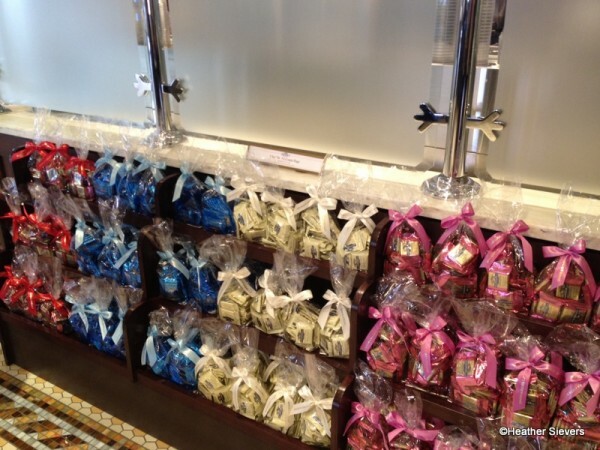 @Heather – I wish we had the chocolate making machines here too! Would be so cool! @Roe – Good dessert plan! I was there about a week after it opened and I noticed the mural was moving but I never knew it was interactive with the sundae orders! 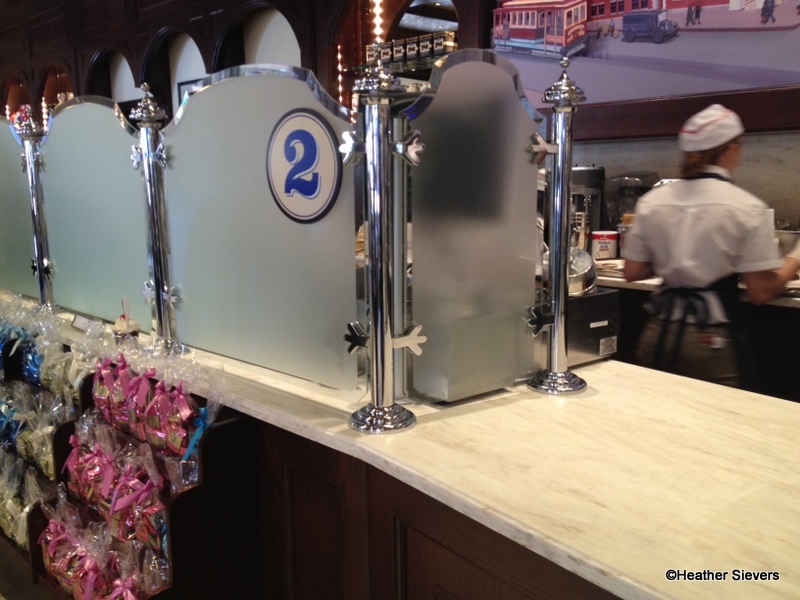 I love the little details Disney puts into their shops that people almost always overlook!